A tour when India’s famed batting lineup actually lived up to their fabled reputations. Editor’s note: This is the second part of the series looking back at India’s Test series wins in England. The first part, where we look at the 1971 series can be read here and the second, about the 1986 series win can be read here. Quick, close your eyes. Think of the year 2007. Which Indian cricketing image flits into your memory? Is it that muggy Durban night where Yuvraj Singh went all-36 on Stuart Broad? Is it the famous Sreesanth-Misbah tango where a misguided scoop ended up reshaping cricket’s landscape forever? Or perhaps, after looking at India’s results in Edgbaston and Lord’s, you’re not in the brightest of moods. Perhaps, the only thing you remember from that year is a young, impetuous Tamim Iqbal repeatedly coming down the ground against India’s hapless pacers. Sri Lanka leaving India’s players in tears and disgrace in Port of Spain, dumping them out of a World Cup which seemed to have been tailor-made for them. Yet, between the agony and the ecstasy, one memory often goes overlooked. India, led by Rahul Dravid, went to England that year. They went to England after beating West Indies away in a series, their first win outside the subcontinent since 1986. They went to England with an opening duo that actually clicked and a middle order that actually scored runs – two facts which again after recent results, might seem quite dubious. Wonder of wonders, they actually won the series. And one of the chief drivers of the victory was a pair of innocuous jelly beans? India’s famed batting order had a noticeable omission when they arrived in England. Rahul Dravid, Sachin Tendulkar, Sourav Ganguly and VVS Laxman were all present and accounted for, but there was no Virender Sehwag or Harbhajan Singh who had both been left out after a spate of poor performances. Gautam Gambhir was the backup opener to, believe it or not, Wasim Jaffer and Dinesh Karthik. Anil Kumble, Zaheer Khan and S Sreesanth were the spearheads of India’s attack with Ishant Sharma, RP Singh and Ranadeb Bose also part of the attack. They also didn’t have a coach. Since Greg Chappell had departed after the 2007 World Cup fiasco, no one else had been appointed in his place. Anderson picked up Dravid, Tendulkar and Ganguly in a searing spell of swing, a sight that would grow more familiar over the years, and India, always nervous starters, were bowled out for 201 in response to England’s 298 in the first innings. A typically manic 134 from Kevin Pietersen meant that India needed 319 to win the Test. The last day saw a back-to-the-wall effort from Dravid’s men who played out 96 overs and just managed to hold the fort with one wicket remaining before rain hit Lord’s. The star of India’s rearguard effort was a unassuming young lad with a mane to rival the best. Dhoni’s 159-ball 76 had those trademark bottom-hand cuts but it also had oodles of grit, with a smattering of good fortune. The end of the Test was tense and heart-stopping – the sky getting progressively darker, India’s last wicket pair of Dhoni and Sreesanth at the crease and England, unable to bowl their pacers because of the light, forced to turn to Michael Vaughan and Monty Panesar. Steve Buckor turned down an extremely close appeal off Panesar and India just about scraped to a draw. And just like 1971 and 1986, India avoided defeat in the opening match of a series, a sign of things to come. Fast forward to Nottingham, Trent Bridge. Swinging and seaming. So when England batted first and limped to 169/7 at the end of day one, it didn’t set off a lot of alarm bells. Yes, Zaheer and India’s pacers had done well, but it seemed par for the course. England were bowled out for 198 but most expected their pacers to come roaring back, with India expected to have done a good job if they managed to gain a slim first-innings lead. Karthik must remember those days with much joy, especially now, in 2018. Opening the batting with Jaffer, the two put on 147. Once that foundation was set, no one took a step back. It was brave, positive batting with India’s legends living up to the vast reputation that preceded them. Tendulkar and Ganguly’s 96-run partnership was the most eye-catching – a throwback to their legendary joint renditions of yore with both batsmen unfurling all their shots. Both fell short of centuries – Tendulkar seven short, Ganguly 21 short – to two terrible decisions. Laxman scored his own nifty half-century and India were finally bowled out for 481, well and truly on top. Hell hath no fury than Zaheer unleashed. Despite India’s yawning 283-run lead, England could still have had a decent chance at a draw. Sreesanth had entered that erratic zone where he completely lost his head, as evidenced in a dangerous beamer to Pietersen in the second innings. Zak though had a point to prove. He took out Strauss and Cook early and then set himself to extract his pound of flesh. Vaughan and Paul Collingwood steadied the ship as England reached the 283-run mark, leveling the scores with just three wickets down. England’s supporters could afford to breathe a little easily, after all, Vaughan had just scored one of his best centuries and looked good for more. But the moment the second new ball was taken, Zaheer struck. Vaughan was a tad unlucky – the ball rebounding off his hands onto the stumps but from thereon, India’s best left-arm pacer turned it his way with the key wickets of Paul Collingwood and Ian Bell. Kumble’s experience added the finishing touch as England collapsed from 287/3 to 355 all out. Even though they lost three wickets, Karthik and Jaffer put on 47 for the first wicket which banished any anxiety. Tendulkar was dismissed cheaply, but fittingly enough, Dravid and Ganguly, two key men behind India’s overseas resurgence in the 2000s, were at the crease to knock off the winning runs. 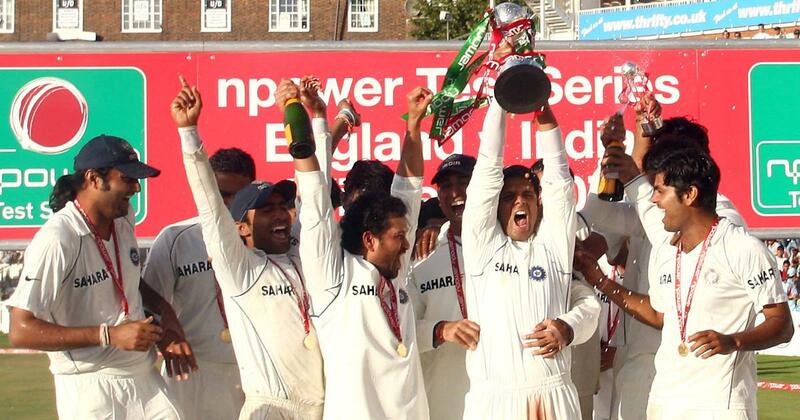 Champagne flowed as India went ahead in a Test series in England for the first time in 21 years. The battle moved to The Oval. India were not in a totally unfamiliar position – in Australia in 2003, they frittered away the 1-0 lead from Adelaide and finished with a drawn series. Last time, they toured England in 2002, the boot was on the opposite foot – they came back from a battering in the first Test at Lord’s to win at Headingley with the series finishing 1-1. Any fears were quickly dismissed after Dravid won the toss on a deck filled with runs. Every top-order batsmen got going – Karthik got 91, Tendulkar 82 – but the real ballast came from the late order. Dhoni again – perhaps his best overseas Test tour – put on the fireworks with four sixes in his 81-ball 92, but the man of the moment was Anil Kumble with the bat. In the sunset of his career, “Jumbo” had worked hard to improve his batting and the results bore fruit. Grim, stodgy defence gave way to a smattering of elegant drives as England’s bowlers were ground down in the London dust. Kumble’s exuberant celebrations when he got his century showed how much it meant to him. Dravid, though, was content to keep batting and when India were finally bowled out for 664, their highest ever score against England at that time, one thing was certain – Dravid couldn’t lose. The only question was, could India win 2-0 and emulate Kapil’s Devils from 1986? The onus was on the bowlers now but on a pitch which still played true, it was a tough task. They still tried, bowling England out for 345 to gain a 319-run lead early in the first session of Day 4. Dravid chose not to enforce the follow-on, a decision which received some stick. The criticism became even more pronounced when India surprisingly slumped to 11/3, leading to some panic in the dressing room. Dravid, in his imitable style, buckled down. His 12 off 96 balls was a peculiar innings in some ways but also quite understandable in others; the series win that they had fought so hard for would not be squandered. England would not be allowed to pass. But Anderson and the rest of England’s bowlers were hardly paying attention to Dravid. At the other end, Ganguly played a short but sweet knock of such immense beauty and languidness that any initiative England might have had was gently prised out of their fingers. His 57 meant India had touched the safe zone and when India finally declared at 180/6, England were staring at a chase of 500. A draw was inevitable but as the two captains shook hands, Dravid basked in the glory of a feat only two great Indian captains before him had achieved. Ajit Wadekar and Kapil Dev now had company. Much has been said of a series where India squeaked out of the jail in the first Test but were by far, the better team in the next two Tests and deservedly won the series. 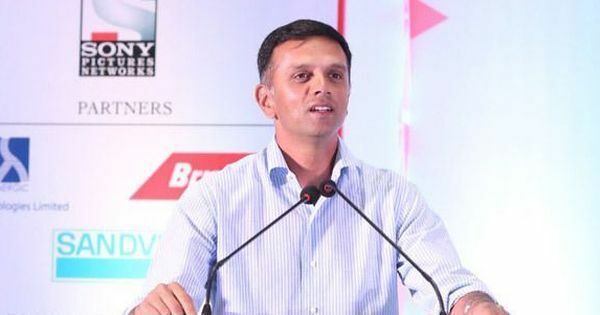 But when compared to India’s next two dismal tours in 2011 and 2014 (and 2018 too, as it turns out), what stood out was the steel Dravid’s men possessed. Their openers routinely soaked up the early pressure. Dravid did not have his best series batting-wise, but always ensured he put a price on his wicket while Tendulkar, Ganguly and Laxman came up with the goods with some majestic knocks. The pitches were not as bowler-friendly as 2018 but Zaheer Khan’s series-turning spell in Trent Bridge swung things India’s way. And of course, India had the wise old Kumble, always willing to come up with a wicket just when needed. In many ways, it was the last great Indian Test team – a team whose reputation gets more fabled with every year.